Your baby will love swinging gently in the Graco Glider Lite. 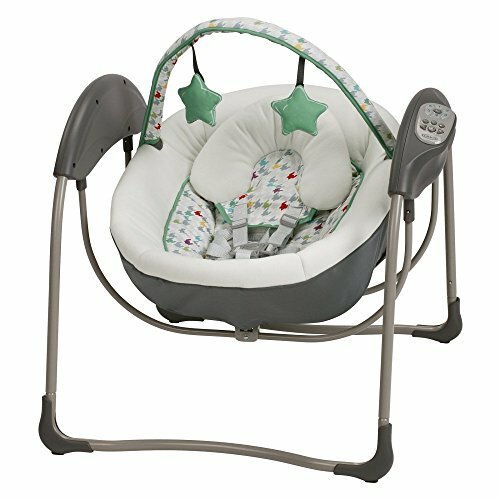 Perfect for giving you some much-needed, hands-free time, this swing will be a favorite of yours and your baby. Featuring the same gentle motion as your nursery glider, this portable gliding swing has a lightweight design so you can easily move it anywhere in the house. Your child will rest comfortably in the roomy, cozy seat with a removable infant head support while the six gliding speeds, 10 melodies, and five nature sounds will work their magic to soothe your little one. And, the portable frame means you can bring this swing with you wherever you go. Additional Features: Roomy seat with soft fabrics and support Timer mode helps extend battery life Toy bar with 2 soft toys Portable frame Available in your choice of color Dimensions: 27L x 26.25W x 28H in.. Fabric, metal, plastic construction. Choice of available color. Option to plug in or use batteries. 6 gliding speeds, 10 melodies, 5 nature sounds. 5-point harness. Mimics the gentle motion of a nursery glider. Dimensions: 27L x 26.25W x 28H in.